Although Lazada is widely criticized by some entrepreneurs because of uncreative strategies — implement viable business model in unreclaimed regions, it is undeniable that the milestones it made are really surprising and exciting. Moreover, despite the fact that Lazada is dubbed as a notorious company, numerous venture capitalists continue investing rounds of funding for regional expansion, setting up more and more subsidiaries in Southeast Asia. With the total amount of funding it raised, US$ 647 million, needless to say, Lazada is one of the iconic unicorn in Southeast Asian startup community. Hence, I believe it would be helpful to write an analysis report about Lazada based on the preliminary data which is available on the internet. First of all, let’s get started with the performance of website across six countries -- Thailand, Vietnam, Malaysia, Philippine, Singapore and Indonesia, respectively. Bounce rate, referring to user behavior that click the leave button without taking a close look, in these countries is not as good as an E-Commerce leader shall be. The numbers in Vietnam, Philippine and Indonesia, most notably, exceed 50%. In addition, Lazada’s performance, whichever the variable is, in Vietnam is relatively awful as compared to other five. Lazada should put more effort in Vietnam and considered performance in Vietnam as its corporate priority in terms of website optimization. Next, the rising concern would point to Philippine when combining the Total Visit, pi-chart , together with other three bar-chart variables. Even though Lazada’s website in Philippine takes roughly 36% of Total Visit, it does not generate anticipated results with respect to website acceptance. Based on the aforementioned primary analyses , the poor and undesirable numbers manifest the huge improvement in Lazada’s website in Vietnam and Philippine. The loss in revenue is expected to be higher in these two countries if Lazada can not fix this urgent issue. The best performance (see the bar-chart only) among all, on the other hand, happened in Malaysia with higher website acceptance. Malaysian, unlike other Southeast Asian, are more willing to spend time browsing and shopping, meaning Lazada’s localization strategies in Malaysia is doing relatively well. When we move on to the Traffic Source chart, paid Ads (see Display) is one of the main marketing channels in all Southeast Asia, except for Singapore, which shows amazing result in Organic Search. In addition, based on the previous performance in each individual country, one can claim that Lazada performs the best in Malaysia and Thailand. The budget allocated for digital marketing campaigns turned out very outstanding, receiving effective impression with fairly good result in Time On Site and Page Views. Indisputably, the spending went effectively to the right visitors through accurate channels, generating amazing outcomes. At the same time, the data in Traffic Source also manifest that Lazada’s strategies for Philippine is the worst -- the paid Ads didn’t receive expected result proportionally. Even though Direct traffic doesn’t look terrible, it could be attributed to the lower language barrier and familiarity with the searching box. The data in Singapore section, to one’s surprise, looks subtly strange because of the unusually outstanding Organic Search. The consequence, perhaps, is related to the timing Lazada entered Singapore -- Lazada started operation since 2014. Singaporean gets acquainted well with Lazada earlier and, therefore, it is unnecessary to spend much on paid Ads, which is the reason why the ratio is significantly lower than rest of other five. 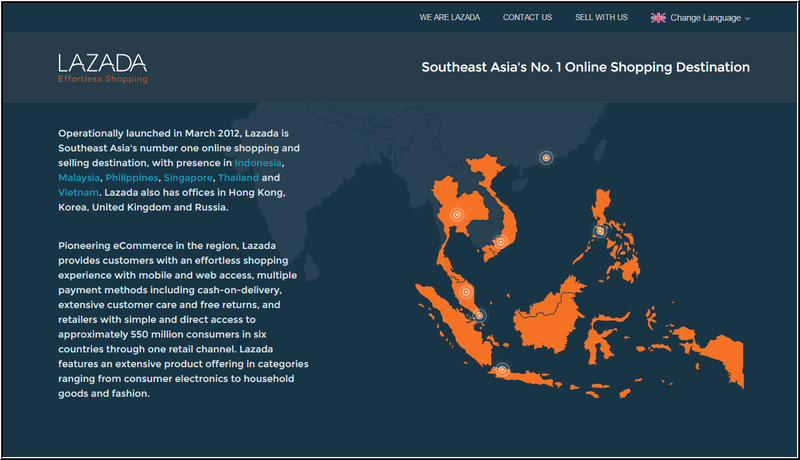 Finally, from the statistics above, one can understand Lazada’s penetration in Southeast Asia. Insignificant as the figures like Google and Facebook are, Lazada has garnered a striking position in the competitive online community with nearly 1.7 out of 100 people reaching Lazada daily. With logistic and mobile infrastructures gradually being set up, these figures are thought higher and could even become the landing page of every internet user in the coming future.